Released by: Seven Arts, Warner Bros.
Bette Davis - "Baby Jane Hudson"
Joan Crawford - "Blanche Hudson"
Victor Buono - "Edwin Flagg"
Anna Lee - "Mrs. Bates"
Marjorie Bennett - "Delia Flagg"
"Barbara Merrill - "Liza Bates"
Dave Willlock - "Ray Hudson"
27 years after an automobile "accident" that crippled film idol Blanche Hudson (Crawford), she relies on the caregiving of her alcoholic former-child star sister, Jane (Davis). When a retrospective of Blanche's films are shown on television, it infuriates Jane to the degree that she decides to regenerate her childhood career as a vaudeville performer all while tormenting Blanche. ​ According to Robert Aldrich, the original asking price for the film rights to the Henry Farrell novel was $10,000.00, however, as interest in the project grew the price escalated, with the final selling price being $85,000.00. Originally, Pearl Bailey was wanted for the role of "Elvira," however, Bette Davis objected. The character of "Elvira" was originally named "Edna". Maidie Norman (who portrays "Elvia") re-wrote her lines in the film to give her character more dignity. The vehicle used in the film which inflicts the injures to "Blanche" is a 1931 model J395 Duesenberg Roadster​​. At the time, t​he roadster was owned by Pacific Auto Rentals and was seen regularly on film sets until the late 1970's when it sold to a private party. Later, it was a frequent contestant in auto shows around the country. Mid-June: Victor Buono is hired. July 23rd: ​​filming begins on Stage 1 at the Producer's Studios in Los Angeles, California. July 25: One of the parakeets used in the film gets loose and flies up to the studio's catwalk​​. Late August: Wesley Addy is hired. September 12th: Principal photography ends. Late-September: Bette Davis and Debbie Burton record the film's song "What Ever Happened to Baby Jane? "​​, which is later released as a commercial record in November 1962. Early-October: ​​The Writer's Guild of America rules Lukas Heller will receive sole credit for the film's screenplay. ​Previously, Writer Henry Essex had sought a credit for an early screenplay he had written for the film. 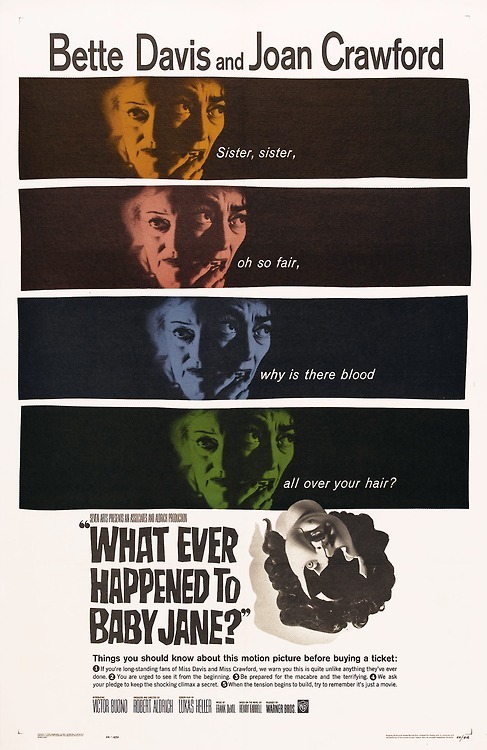 Early November: A record of the film's title song "What Ever Happened to Baby Jane?" sang by Bette Davis and Debbie Burton ​​was released by MGM Records. On the reverse side was "I've Written A Letter To Daddy" sang by Debbie Burton. ​ The film was originally slated for a December 1962 release, however, Warner Bros. upped the release to November In order to get exhibition dates to qualify for 1962 Academy Award nominations. October 22nd, 1962: A special invitational screening is held at the RKO 86th Street Theatre in New York for Warner Bros. executives. October 31st, 1962, the film is limitedly released in New York, Los Angeles and select cities. $779,800.00 (Opening week - October 31st, 1962) New York​​. $48,500.00 (Opening week, 2-days - November 7th, 1962​) Chicago. $85,000.00 (Forth week) 25 theaters - Los Angeles, California​​ (Includes $8,200.00 at the State and Iris Theaters). $16,000.00 (Sixth week - December 5th, 1962)​​ Chicago, Illinois.